Yes, there is another Southwest! Today I am co-posting with Susan from The Modern Trobadors. She had an opportunity to try out some wines from the Southwest (Sud-Ouest) Region of France, specifically Gascony. If you want to know more about wines from this region, click here. Susan asked if I would be willing to make some Gascon Cuisine to go with her wines and I, of course, responded with an eager yes! 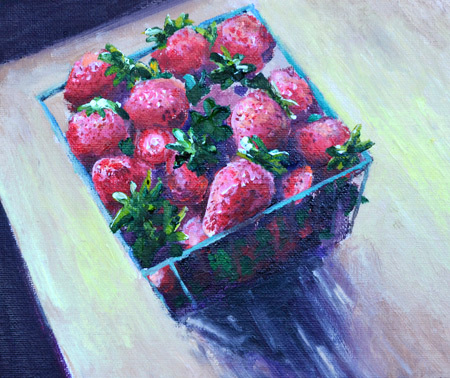 A favorite painting of ours by our friend, Donn - he captures the light so beautifully. Mark and I recently visited Susan and Towny and this provided the perfect opportunity to create our co-post. 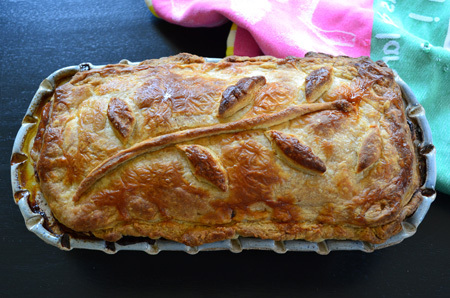 For the main course, I made a terrine of pork, duck, veal and foie gras, encased in buttery, homemade quick puff pastry (this fantastic pastry recipe is courtesy of my friend Paula from Vintage Kitchen Notes). We invited foodie and winey friends Win and Claire to join us for the meal. Win, proprietor of South Street & Vine (a delightful wine and cheese shop in Portsmouth, NH), made some great suggestions on pairing and serving the wines. The terrine came out of the oven about an hour before the guests arrived and, as you see here, it looked darned good. Sadly, though, my creation needs some tweaking before I share a recipe with you. Don't get me wrong, it was one of the best tasting pâtés I have eaten, but it did not unmold well and ... well ... it was a visual mess, and looked a wee bit like a ship-wreck. Maybe it only needed a day in the fridge to gel? After a little more experimentation, I will let you know. The day before, I was paging through Susan and Towny's book, A Culinary Journey in Gascony by Kate Ratliffe, and happily found just the right dessert recipe, which I share with you today. It is simple, elegant, and light, which is important after eating a Gascon meal. Theirs (including my terrine homage) is generally a heavy cuisine, requiring a light touch for dessert. So, really, this post is Sud-Ouest Cuisine, Part One. 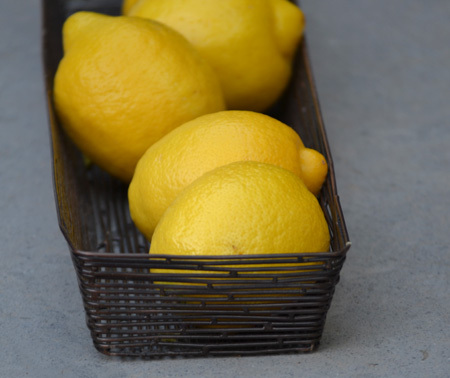 This will be my summer post and, when the weather cools down a bit in the Tucson desert, I will post Part Two: the terrine recipe. 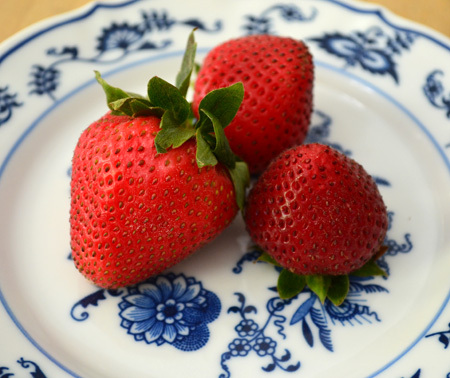 • strawberries, which are coming into season in many markets in the northern hemisphere, probably in Gascony, too! We ate this dessert paired with a St. Albert AOC Pacherenc du Vic-Bilh - a wonderful dessert wine reminiscent of a Sauternes. Win made the suggestion that this particular wine begged for a cream-based dessert. As I am not one to argue with authority (or cream), I made a minor addition to the original recipe by topping it with a dollop of unsweetened crème fraîche. Thanks to Win, it was an amazing pairing. 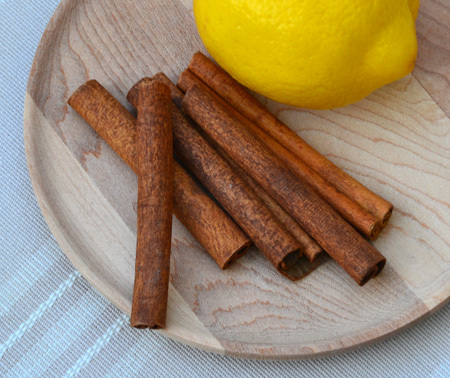 The night before you plan to serve this, place the wine, cinnamon stick, sugar and lemon zest in a large, non-reactive saucepan and bring to a boil. Reduce heat and let simmer for 5 minutes. Set aside to cool. 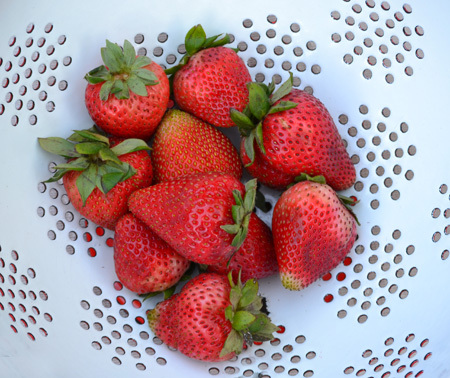 Place the hulled strawberries in a glass or ceramic bowl. Strain the cooled wine mixture over the strawberries and let marinate overnight in the refrigerator. 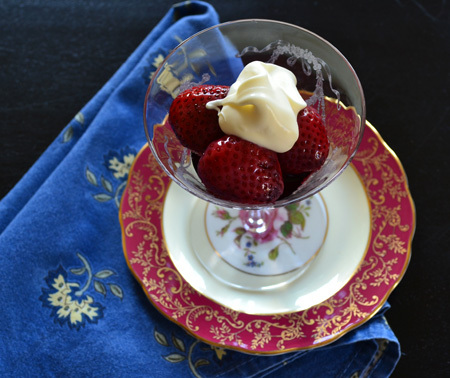 Just before serving, add the Armagnac and divide strawberries among 8 bowls or goblets. Add a couple of tablespoons of the wine-Armagnac mixture to each serving. Top with a dollop of unsweetened crème fraîche and serve. You name any good liqueur like Armagnac and I´m in! It looks darn good, and love that you used creme fraiche, that stuff is unbelivable. Though I would one of our malbec wines, did you know the grape found it´s best habitat in Mendoza, a province in this country? This is a sophisticated dessert anyway you look at it David! And of course, I want that terrine recipe. Of course. Kirsten - nice to have a simple dessert like this for the summer! Paula - I am well aware of the Argentinian Malbecs - until I had the Cahors, I always assumed that you were the only ones making Malbecs. Your pastry was phenomenal - I am forever indebted to you for this, as I have not been a puff pastry fan in the past. The store bought stuff is awful. Not to worry, Laura - that terrine will be seen here sooner than later! It tasted so good! All I need is a little research... You really need to try Paula's pastry - so good and so easy! I will never go back again. This is so lovely and easy! 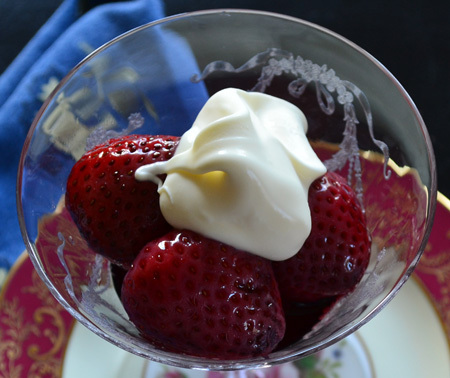 Colette - It really couldn't be simpler - and it makes the strawberries shine! I'd be willing to forgive any ship-wreck-looking food, had it contained foie gras! It looked good when it was in the tin and the taste was perfection, so that's all that matters. Not only do I love this recipe, I have the same Fostoria Garland sherbet stems! I think it's an omen - I have to make this! Thank you Valentina - I am so glad we met, too. I am ever grateful to my blog friends for the support they give. I also love meeting people with the same aesthetics, and also learning from their creativity - both in the kitchen and behind the camera! It is a sign, Susan - and those glasses (although Susan's Fostoria, not mine) were perfect for this. My grandmother had a lot of it, too, and we four boys broke most of it when we were young. I only have one vase left - a celery vase. Have fun! These marinated strawberries looks delicious.. Need to make them asap. 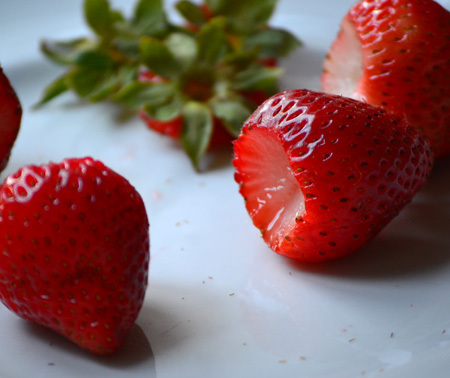 Having been part of the dinner party, I can confirm that this simple preparation of strawberries was sublime and, as with everything David prepares, it was elegant in presentation, too. The terrine was divine too. The combination of foie gras, pork, duck, and veal set off culinary fireworks! Everyone loved it!! Let's hope there will be a cold spell in Tucson soon so David will make it again! Thanks, Mr. & Mrs. P! I bet they would be very tasty with your lavender cocktail! Susan - cooking with you and Towny is always so much fun. The adventures are endless! I am hoping for cool weather, too, but I don't imagine I will see any for a couple of months! Thanks fro finding those great wines to introduce us all to Gascon food and wine! I'm delighted to find a post that not only is terrific but that I can relate to as I have been to South St. and Vine. I'm a New Englander and live not that far away from Portsmouth...go there for dinner all the time. Thanks, Karen! Glad you found C&L! I just spent some time on your blog - and I have to say that next time we are in New England, we should meet up for coffee and share experiences! Thank you for introducing me to Vintage Kitchen Notes. I am now a subscriber. You have good taste in food sites. Hope you are getting the lovely rain of the desert without any of the destruction. Stay safe!